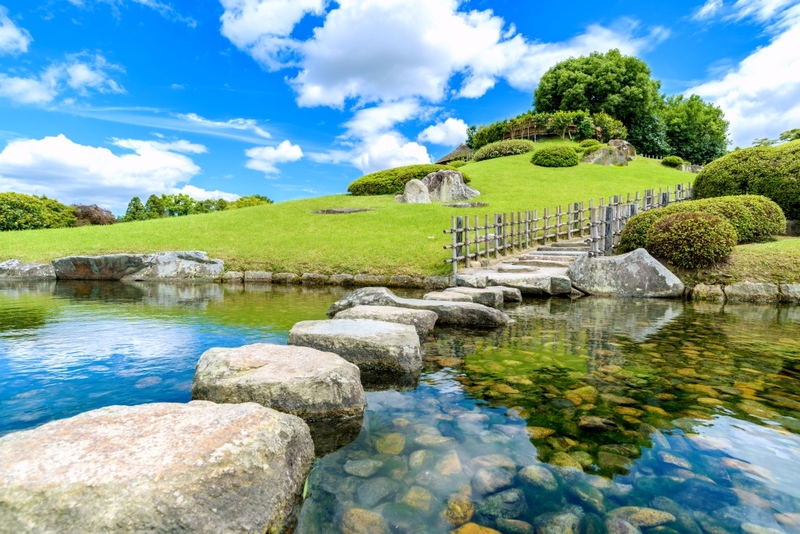 After visiting one or many of the 55 golf courses Okayama prefecture has to offer, be sure to take time to explore this beautiful rural landscaped area. Affectionately referred to as “the land of sunshine” by the locals, Okayama has a mild climate and boasts having the most number of fine days per year in Japan, making any time of year comfortable to visit. Located in the Chugoku region, the prefecture’s capital Okayama city is easily reached from Kyoto and Osaka by a 1hr Shinkansen ride. Okayama Prefecture contains many historic sites of interest so it is hard to choose just a select few. The most notable however, would be Okayama Korakuen Garden (後楽園) with its 3 star rating in the Michelin Green Guide Japan. This garden was built over 300 years ago and has 13 ha worth of ponds, hills, a teahouse (great opportunity to try traditional Japanese green tea) and spectacular views of Okayama castle. Once you have finished strolling the garden, take a walk through Okayama castle (岡山城). Here you can dress up in traditional clothes and walk through the castle like a feudal lord or lady-- taken back in time to the Edo period. Other sites worth visiting are the well-preserved canals in Kurashiki city (倉敷市), the “castle in the sky” (an original mountain-top castle) in Bitchu-Takahashi(松山城), the modern art in Inujima Island(犬島) and the Japanese sword museum where you can see how the blades are hand crafted. There is something going on in every month but the most popular tourist driven events are in Summer and Autumn. Okayama Korakuen Garden puts on a “special late night garden of dreams” during this time. Here, the picturesque garden is lit up by hundreds of lanterns and illuminations giving it a hint of fantasy and romance. The first Sunday in April is when you can witness a 1km in length procession of people dressed in traditional costumes marching through Okayama city in the Goshinko festival. If you’ve just missed that, then on the fourth Sunday in April you can still participate in the Yosei tea ceremony event which has been running since 1933. When you think of Okayama prefecture you think fresh air and fresh food. Due to the location and climate, Okayama spoils its visitors with both exceptional fresh fruit from the inland and fresh seafood from the coast. Often referred to as the ‘Fruit Kingdom’, Okayama prefecture produces high quality fruits, in particular, muscat grapes and white peaches. If you are visiting in summer than be sure to go pick your own juicy sweet white peaches. If you are visiting in Autumn than muscat grapes are hanging there just ripe for you to pluck. From jewels of the hills to jewels of the sea, fresh oysters from Hinase are another very popular delicacy in this prefecture. If you are lucky enough to visit a seafood market, the chef will cook one right up in front of you! Be sure to also try oyster okonomiyaki - a delicious seafood spin on the traditional japanese savoury pancake. Oyster season is from October through until March. Even if you missed the grape picking season, you can still take home a bottled up version of the local mountain grapes from Hiruzen winery in Maniwa city. Hiruzen winery produces a diverse range of wines some of which contain wild grapes only found in Japan. Of course for unique wine you are going to need some unique wine glasses. Kurashiki glassware is hand-blown and crafted by artisans in Okayama. Each piece has a high-quality design and a handmade texture with a thickness that is durable enough to take back home with you without concern. Why engage in that classic beach vs mountain debate when you can have both? With coastal views and mountain backdrops to take in, the abundance of fresh fruit and seafood to dine on, and of course the 55 golf courses to choose from, your stay in Okayama will not disappoint. Catch the JR Tokaido/Sanyo shinkansen straight to Okayama station. The trip takes 4 hours and is is covered by the JR Rail Pass (otherwise around 16,500yen one way). Alternatively, you can get there a little faster via plane. ANA offer flights from Haneda to Okayama, taking around 1hr 15 mins and costing approx. 12,500 to 37,000yen one way. Catch the Sanyo shinkansen from Shin-Osaka station and you will arrive in Okayama station within 50 minutes. This trip is covered by the JR Rail Pass (otherwise 5,500 yen one way).